Have students try these activities to expand their knowledge and interest in World’s Early People. Life was very different for early Homo sapiens than it is for us today. 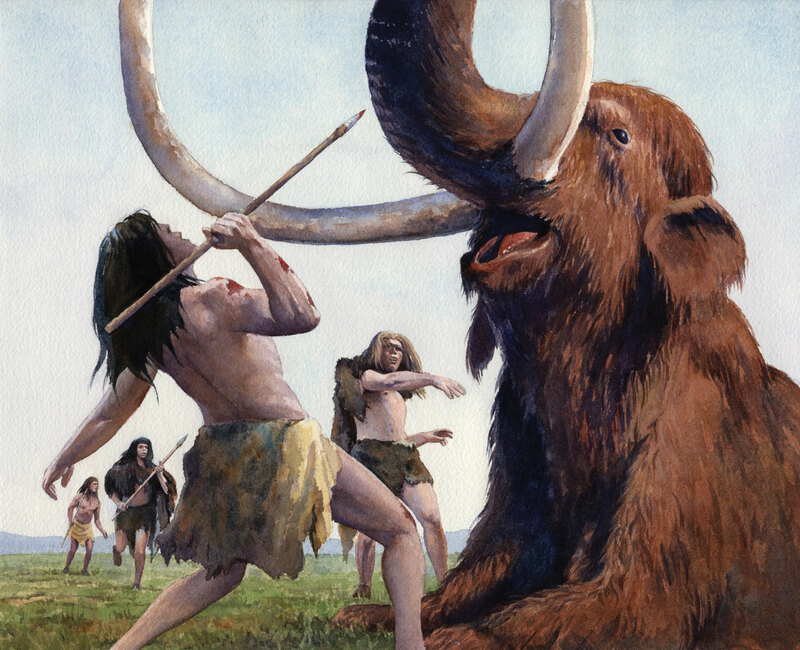 Have students write short stories or poems that describe and characterize the experiences of early humans, from hunting and gathering to playing and interacting with family members. Students can use the Internet or other available resources to do research and inform their stories; however, the purpose of this activity is to get students to imagine what life would be like under dramatically different conditions, and so it is not primarily a research-oriented activity. Encourage students to think about the challenges that early Homo sapiens would have faced and to include these in their stories or poems. Have students share their stories or poems with the class. Archaeologists study artifacts, or old objects left behind by the inhabitants of an area. What was mere garbage to an ancient Egyptian might tell a modern-day archaeologist a great deal about the conditions under which ancient Egyptians lived, for example. Bring in an “artifact” of your own for the class to study and discuss. This could be an old item of yours or something you found just for this activity. You could bring in an old piece of cookware, a pair of shoes, or just about anything else that will give students opportunities to make inferences about past events and conditions. Encourage students to begin thinking like archaeologists and to attempt to draw conclusions about prior conditions or events by looking at your artifact. You may also bring in multiple artifacts, if appropriate. Lead the class in a discussion of the techniques used by archaeologists to learn about the past. After the agricultural revolution, Home sapiens gradually stopped living as nomads and began to establish the first villages. Ask students to draw plans for a small Bronze Age village. Students should think about the challenges that Bronze Age humans would have faced and should design their villages with some of these challenges in mind. Have students display their village plans together as an exhibit in some part of the classroom or school. The lives of Home sapiens changed dramatically with the advent of agriculture. Ask students to write reports comparing and contrasting the lives of Home sapiens before the agricultural revolution with the lives of Home sapiens after the agricultural revolution. Students should use the Internet or other resources in order to learn more about pre-agricultural life and about early Bronze Age life. The purpose of this activity is for students to become more familiar with factual information inasmuch as it pertains to these topics, so research is central to this activity. Ask students to write reports that investigate the relevant comparison. Encourage them to write in a scholarly way and to cite one or two of their sources. Have students present their reports to the class. The Bronze Age gave way to the Iron Age around 1200 BCE. The transition marked the eve of many of the greatest human civilizations in history, including ancient Egypt and ancient Greece. Have students work together as a class to research and understand the differences between life in the Bronze Age and life in the Iron Age. Students can use the Internet or other available resources to gain information. Then, as a class, assemble a large chart or table that compares Bronze Age life to Iron Age life and discuss the contents of the chart or table together as a class. Who will protect the community? Besides farming and protection, what other jobs need to be done? Help students to get a feel for the impact of the agricultural revolution on social organizations and hierarchies.